The following form can submitted to Rabbi Chaim Zvi Ehrenreich online no later than Thursday, April 18, 2019, 12:00PM EST. I fully empower and permit Rabbi Chaim Zvi Ehrenreich to act in my place and stead and on my behalf to sell all chametz possessed by me, knowingly or unknowingly as defined by the Torah and Rabbinic Law (e.g. chametz, possible chametz, and all kind of chametz mixtures). This power is in conformity with all Torah, Rabbinic and Civil laws. Optional Donation It is customary to make a contribution along with your sale of Chametz. 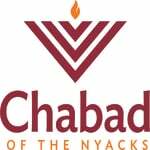 Please consider supporting the work of Chabad of The Nyacks.